Mine: Great western, maybe the best I have ever seen. Only the very end seems to be false. 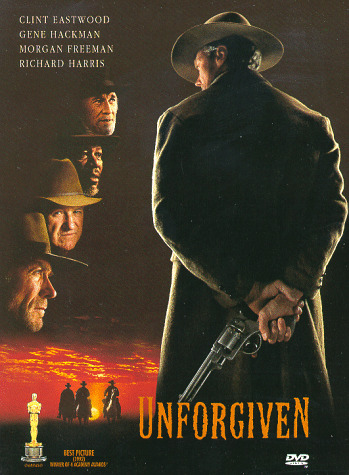 If he is 'Unforgiven" there is no way that he should live. Leonard Maltin/Plot synopsis: Elegiac anti-Western about a one-time mad killer, long since reformed, who comes out of "retirement" to make one more hit because he needs the money for his family. Powerful examination of morality and hypocrisy in the Old West--and the impact of killing (and being killed)--but marred by a midsection that plods. Exquisitely shot by Jack N. Green. Oscar winner for Best Picture, Best Director, Best Supporting Actor (Hackman), Best Film Editing (Joel Cox). Panavision.